You don’t have to take our word for the high standards we offer. The following comments were written by some of our clients at the end of their visits. The original hand-written comment cards are available to view on request in the salon. We were absolutely delighted that the team from Ciente supported the Hospice of St Francis' Pamper event. They gave their time and expertise for free and helped raised valuable funds for the hospice. The girls were professional, friendly and feedback from the guests was very positive. What a great team! Thanks for your help!" I have been a client of Ciente for years. Their customer service surpasses any other salon in town. They are on another level. Most importantly - I always walk out of Ciente loving my hair. For these reasons I am a loyal client - as are most of my friends here in Berkhamsted. Trisha at Ciente clearly understands good business. The team at Ciente give provide good service and as a result have created a consistent clientele. The salon always has an upbeat and buzzing atomosphere. This is something to be proud of - especially in the current economic climate... Trisha appreciates this I think as she is always giving back to her community. I experienced Ciente's community 'give back' first hand as a member of the Victoria School Association here in Berkhamsted. I produced a Fashion Show at Victoria School in November of 2009. Initially my intention was to request a voucher from Ciente for the Fashion Show raffle. Trisha not only agreed to the voucher, but then suggested that a team of her stylists could provide hair styling and even a bit of makeup! I was over the moon. Ciente's logo then went onto our posters. The connection to Ciente gave our event more credibility, no doubt about it. Our 5 mums and one teacher all looked stunning and glamorous on the night. Trisha and her team accommodated them all in the salon on the evening of the event. Ciente took the time to take care of our models on what was already a busy Friday night in the salon! Additionally - Ciente financed the VSA school calendar 2009 and ALWAYS supports the Summer Fair, Xmas Fair, Promises Auction and so many other school fund raisers in between. I would like to say THANK YOU once again to Trisha and the entire CIENTE team for their continued support. I have worked in this industry for many years and met Trisha a year ago. I was curious as I knew a little about her salon which had all been very positive and now I know why. Trisha has an unquenchable thirst for knowledge and new ideas that is infectious. She has created a wonderful team at Ciente all of whom are a real credit to her and mirror her enthusiasm, professionalism and passion. 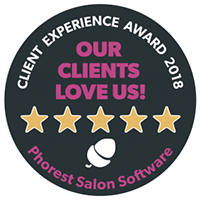 The atmosphere in the salon is always welcoming and friendly yet with a purposeful attitude that creates the perfect client experience’. I would like to thank you and all the staff at Ciente for supporting the BerkoAstro project at Ashlyns School. The project will not only benefit the school but all age groups within the local community. We have been very fortunate to secure the backing of local businesses, especially during these difficult economic times. We are most grateful to you for being the first business to sign up as one of our sponsors; this most surely prompted others to do the same. Without this we would not be able to raise the considerable amount we need to get this project off the ground. Your continued support is much appreciated and I look forward to the day all our hard work pays off and the astro-turf is ready for use. Joanne and I had a lovely time at the salon this afternoon! Huge compliments when we got home reinforced our mutual feelings of fabulousness. Joanne was so delighted to be given free products, to say nothing of the glass of wine and extremely warm welcome. Look forward to seeing you next month……..don’t be surprised if I have company! Thank you for opening your Salon on a Sunday! Finally I am able to fit in an appointment out of working hours. I visited the Salon yesterday and wanted to say what justice your Team does for the business. The Team are genuinely friendly and warm. From the moment I walked in, there were smiling friendly faces to meet me despite the miserable weather outside and the fact that they were working on a Sunday as a service to the customers. The lovely lady on reception was more than caring, offering me drinks or whatever it took to make me comfortable. The tall beautiful young lady who washed my hair has the massaging hands of an angel and what a pleasurable converstaion she holds...I really was impressed wtih the method in which she towel clad my wet hair!! Such a special touch! And then there was Georgie......very professional, a good listener who wasn't going to cut my hiar until she understood just what I needed. Thank you Georgie for the warm smiles and quirky conversation. You made Sunday a pleasurable and worthwhile day....my hair is just what I wanted! Liam, I look forward to meeting you for some creative colouring on Tuesday. Thank you, my hair colour is fantastic and I 've had so many compliments since you did your tricks with the colour. You are a true colour professional!! Thank you so much for my lovely "do" (as always!) it's already garnered me compliments. I'm so gonna miss your skills and of course I'll miss you and your wonderful staff as well. I do hope I'm able to find a replacement that's half as good as you or otherwise, as I said, I'll be the one wearing the hat!! I'm also grateful for you recommending me to the Pepper Foundation. Thinking I'd be suited to a job which was advertised to graduates - wow, what a boost - thank you for that! Now I know you giggle every time you say you've just done another great hairdo, as we all do, but I'm not sure you believe just how amazing you really are? I don't know anyone like you. How you keep so many plates spinning and still look so glamorous and yet be so down-to-earth - it's marvellous! Trisha you truly are an inspirational person. Listening and talking to you has given me the confidence to do so many things I wouldn't have done before. I'm sure the fact I've been sufficiently motivated to try and make a fresh start down South is mainly due to your inspiration (I'll tell my Mum you're to blame!!) Carpe Diem, eh? And I hope I am! You're my hero - take care of yourself though and I'll hope to see you again very soon! Have a great Christmas (with Cliff!) and continued success in 2012! "Just want to say thank you for a great haircut and experience at your salon wednesday.The salon has a great vibe about it, great staff,especially sam who really listened to what I wanted and my hair hasnt looked this great for years ! Had so many compliments about the cut. Will spread the word and will be definately returning. Thanks to Sam again !!"